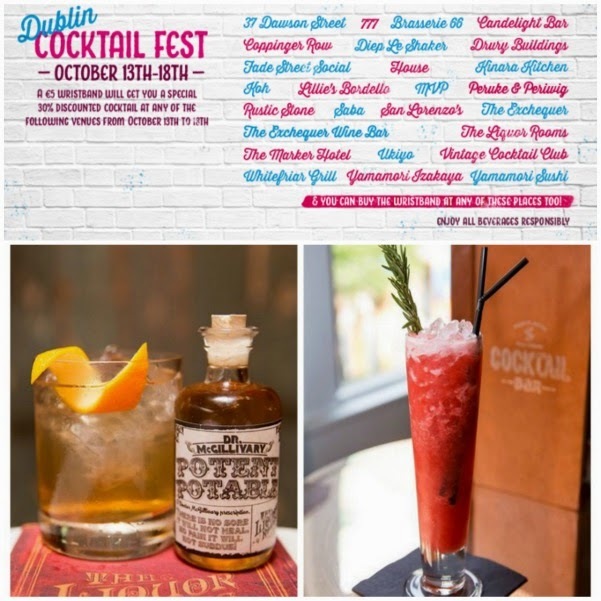 #dublincocktailfest, 13-18 October: get into the spirit(s)! This week might just be the best week ever: the very first Dublin Cocktail Fest, a celebration of all things magical and mixed, launched yesterday and runs till the 18th October across 25 of the city’s finest bars. We didn’t always have a first-class cocktail scene, but times have changed - and the venues taking part are amongst our buzziest and best. The list (top pic) features some of my favourite drinking dens– like The Exchequer and The Marker (click through for my reviews), as well as lots of hotspots I’ve been dying to check out. So how does it work? All you need is a wristband – which you can pick up for €5 from any participating venue – and a thirst, which you can quench with 30% off the specially selected festival drinks. Use the #dublincocktailfest hashtag to vote for your favourites on twitter, or head over to the Facebook page. I'm loving the sound of Fade Street Social’s Rhubarb Tart - Absolut Vanilla, lemon juice, rosemary, rhubarb puree and bitters – and Dr McGillivary's Potent Potable, from The Liquor Rooms. It’s mixed with Jameson Black Barrel, Ginger Liqueur, Apricot Brandy, Liquor Rooms Spiced Porter Syrup, Angostura and Chocolate Bitters. They're both pictured above. Drink up, Dublin, I’ll see you at the bar!